The three weeks we’ve lived in the Babushka House have felt a bit like camping. 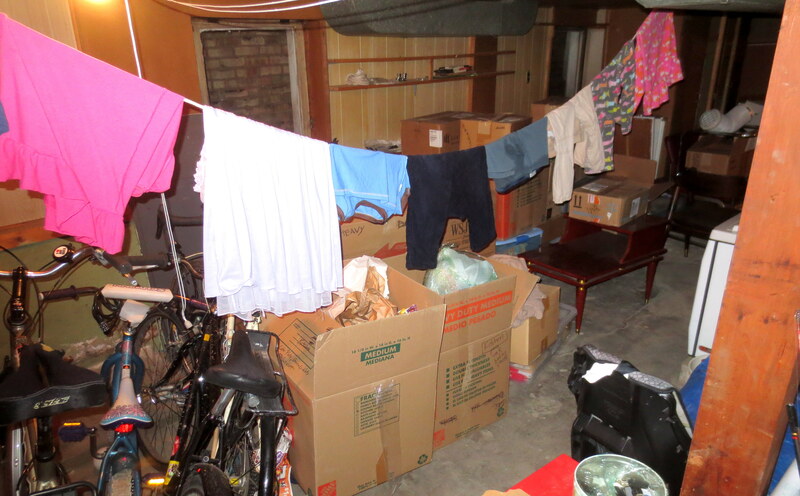 For most of that time, we’ve had no working living room, dining room or downstairs bathroom. One of the bedrooms is leaking, and the kitchen has zero counter space. 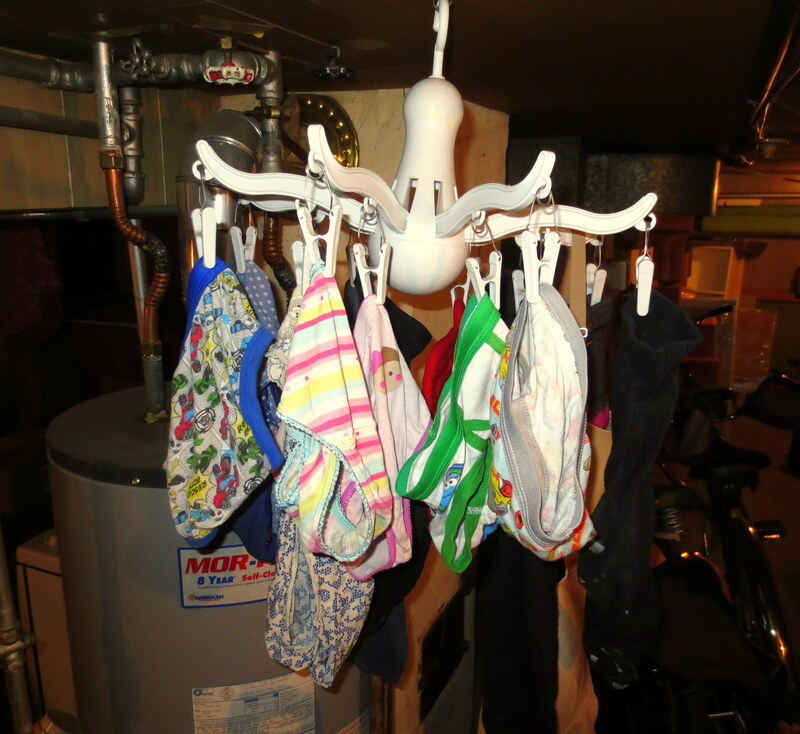 Worst of all, we have no dryer. 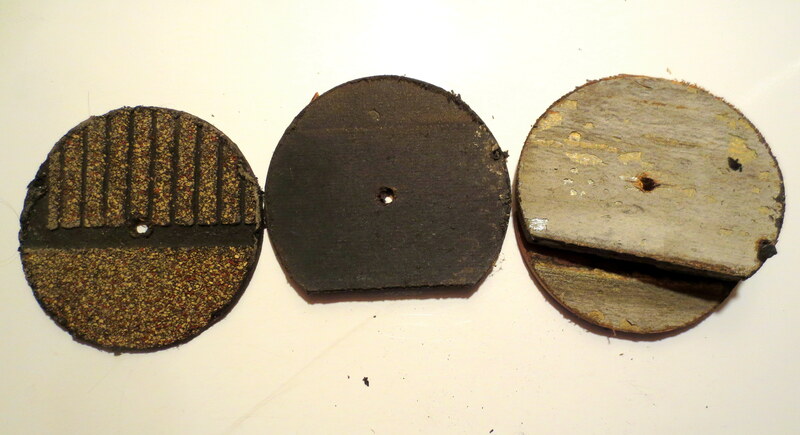 Yes, that is load-bearing tar paper. 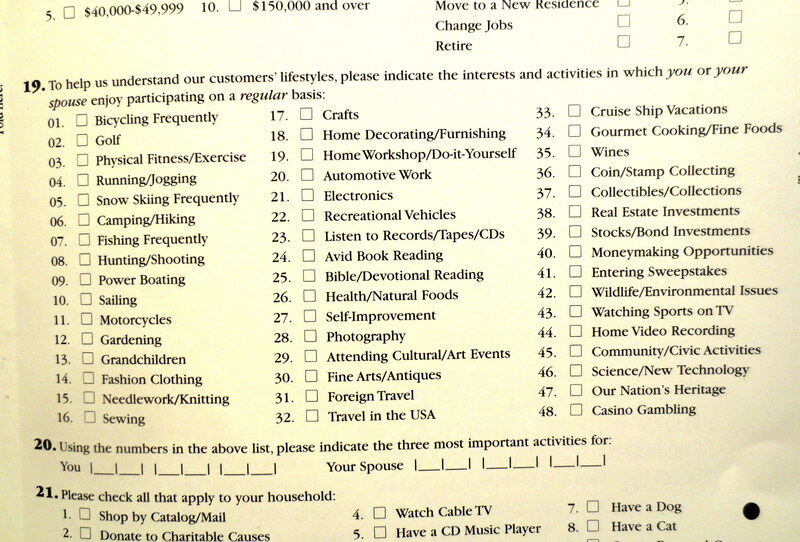 I’m temped to send in the registration card, but not sure which activity best describes my lifestyle. Why must I choose between Moneymaking Opportunities, Listening to Records/Tapes/CDs, or Cruise Ship Vacations? Technically, the washer still works. I’m not sure it actually cleans our clothes, but it definitely gets them wet. Which means they also have to get dry. Somehow. Doing laundry without a dryer (in the winter) has become such a pain that I’ve found it easier to wear the same clothes every day. 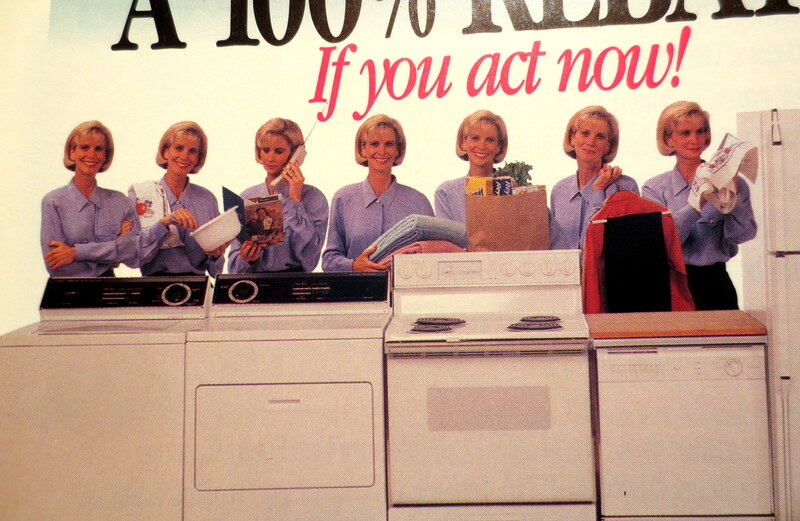 * There’s nothing like letting your clothes dry to a crispy, paperlike texture in a dank, musty basement to make you appreciate the luxury of modern laundry appliances. A half hour into my search, my phone rang. A friend was calling to ask if I had returned her lice shampoo that she loaned me last year (I had). Panic! Our children are close friends and spend a great deal of time hugging, and presumably, rubbing their heads together. I hung up the phone, pulled out the clippers and buzzed my youngest child (the least likely to sit still for lice treatments) nearly bald. This would also be a good time to wash and dry the kids’ sheets on a VERY hot setting. – Cloth Diaper Poo-Eraser®, with separate settings for Newborn Poo, Toddler Poo, and Diapers That Have Been Sitting in a Wet Pile for So Long They’ve Turned to Ammonia. – BabyVomitSensor™ adjusts cleaning power for either milk-based or solid-food-based throw-up, so you never have to guess. – PocketScanner® checks for candy wrappers, chip bags, pencils, earbuds and wads of gum (sends an alert to parent if condoms, cigarettes, love notes or rated R movie ticket stubs are detected). – Tough on Towels™ that have been sitting in a wet ball on the floor for a week. Again. – Sorry, I don’t know anything about dogs, but I hear they’re pretty stinky. …WHAT NEW SETTINGS HAVE YOU DREAMED OF? * Whom am I fooling? I do that anyway. PRO-TIP! Wool socks never get smelly. You have Made My Day. I was reading this on my laptop, sitting up in bed with my morning coffee, and now my stomach hurts from too much laughing, there are tears rolling down my cheeks, and periodically I repeat phrases like “Dried On Booger Chiselling”. And my coffee is cold, but I don’t care… I’d actually like a machine that didn’t do complicated origami/knot tying with the clothes, that would remove truck grease and diesel from the Husband’s work clothes, and has a tomato sauce stain exterminator. But I fear they haven’t invented it yet. Buying a washing machine, I look first for low price (it’s going to break anyway), second for a quick wash (life is too short for laundry) and thirdly an efficient lint catcher (the pocket change is MINE!). I bought a new washer a month ago. It’s a maytag bravo, and I might actual love it more than my husband and cats combined. Our dryer, which was only three years old, broke last weekend. We tried to fix it, but it just wasn’t to be. It’s going to be another week or so before the new dryer gets here, and in the meantime I have wet clothes hanging from every flat surface and door frame in the house. I though air dried stuff was supposed be soft, instead i just have crunchy pants. Sears has a scratch and dent outlet in Franklin Park or somewheres out there (West on Grand over the DesPlaines River). We’ve bought our washer and dryer there years apart. The cool thing is the one you see is the one you buy. They still deliver and warranty everything like a new machine, but there are $aving$. When we got our washing machine there were two nearly identical machines- one was “Energy star” rated. SO I bought it. Turns out the only difference is on the cool, warm and hot settings it mixes in a little cold water. great. I want the machine that comes with these settings.